We love Seattle and Vancouver but felt we needed a little more sunshine. Sedona, with its geologic grandeur and rich Native American heritage beckoned, but the absence of children negated the village I longed to be a part of. Debbie had a fondness for Florida, but with the exception of Miami, it too smacked of being a place where old people go to die. The one town that seemed to have it all—village, sunshine, vibrancy, and beauty, not to mention gumbo, jambalaya, and shrimp etouffée (did I mention food?) was New Orleans, where we’d been vacationing for years. With all signs pointing toward the party that never ends, we packed our bags and headed south, eager to scout the city’s neighborhoods. The French Quarter was too touristy and expensive, the Garden District too sedate. One neighborhood in particular captured our attention with its mix of young and old, black and white, artists and musicians—all living amidst hole-in-the-wall eateries dotting every block. Sprawling along the Mississippi River, the neighborhood called the Bywater boasted one particular venue we’d already come to like—the Country Club, which isn’t a country club at all. Originally a gay resort launched in the 1980s, the Country Club is a historic home with two dining rooms, kitchen, and bar fronting a backyard paradise with a salt water pool, in-ground hot tub, sauna, and tiki bar nestled among towering palm trees and thick clusters of bamboo. In the early 2000s, women discovered the Country Club, and not to be deprived, took the place by storm. Today, couples of all orientations kiss discretely in the pool surrounded by hundreds of sun worshippers reveling on the playground. Kat called a month later sounding dejected because no one had responded. “Of course not,” I said, “with a sample size of eight!” I thanked her for her efforts and told her not to worry. With her help, we’d eventually find something. Another month passed. The phone rang while I was under the hairdryer at a beauty parlor, primping for an annual party Debbie and I were hosting in Chicago. Kat sounded out of breath and excited. Between pants, she told me a man had just called whose father had recently died and the family wanted to sell the house. He’d gone there for the first time in months to gather the mail and found Kat’s letter along with two others from other realtors. He read all three and called her first. Adrenaline surging, I asked the price and looked up the address on the Internet. “That’s not all,” Kat said. “The lot’s double wide and double deep. It’s one of the biggest properties in the Bywater! And it has PARKING!” “Call him back,” I said. “Tell him I just bought his house and I’ll be driving down in the morning to pick it up. Twenty-four hours later, I shook hands with John Fontenelle, and Kat started the process rolling. 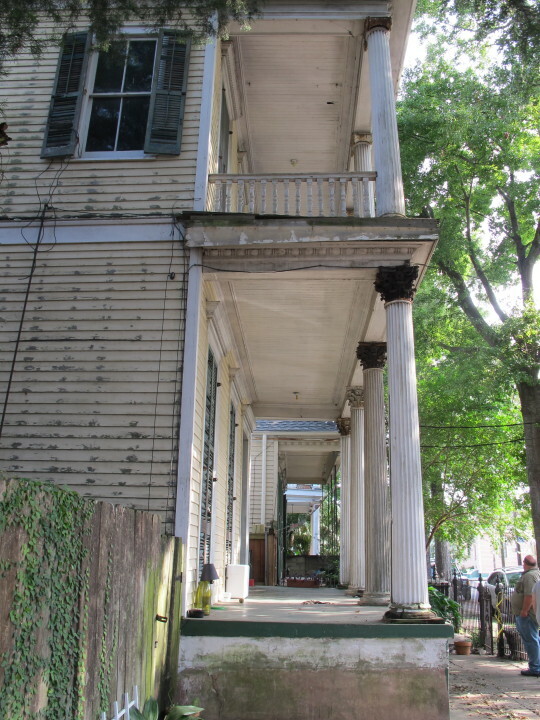 On the day of closing, I stood on the front porch of the run-down, yet dripping-with-potential Civil-War-era plantation house with upper and lower galleries and majestic fluted columns and shook my head, wondering how such a thing was possible—being able to buy one of eight hand-selected houses, none of which was for sale! I took a few pictures and crossed the street to take a few more. From that perspective, it suddenly dawned on me. The house I’d just purchased was none other than the one that had turned my head, capturing my imagination years before.